For sale is one (1) set of ten (10) Mustache Scout SWAP or Craft Kits. There are five different colors of mustaches: orange, yellow, turquoise, pink, and green. You will receive all the supplies necessary to create two of each color (ten total). These SWAPs are perfect for any SWAP event - troop meeting, campout, or SWAP & meet. 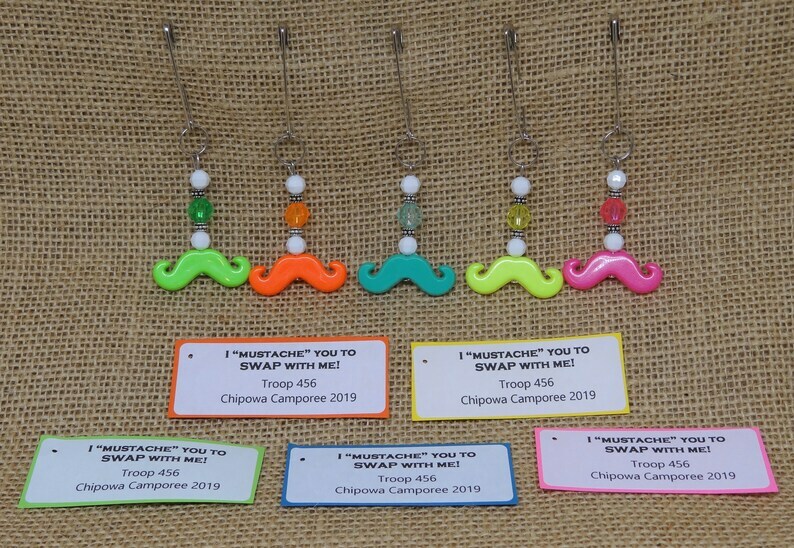 There is also one set of all yellow mustache SWAP kits left for purchase. Each kit comes with a different color mustache bead. The girls can string the beads according to the photograph or use their own pattern. An adult (or older girl) will need to close the top of the head pin with a loop using round-nose pliers. The head pin is pre-cut, so no trimming is necessary. All of our craft kits are individually packaged. JUST ADD ROUND-NOSE PLIERS!